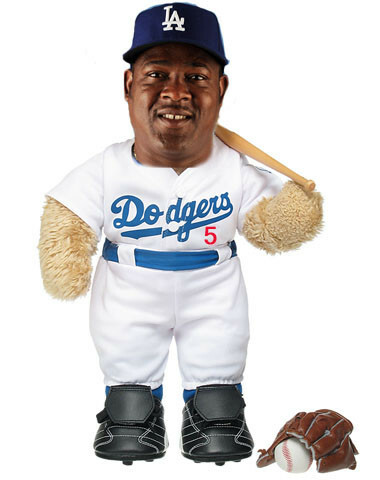 There have been Dodgers who have had their downs and ups, but I can’t remember such a purely bottom-to-top tale of redemption as the one of Juan Uribe. Uribe’s season-long renaissance, in the third year of his three-year contract with the Dodgers, reached full flower tonight, with a double, triple, home run and seven RBI in the Dodgers’ 10-2 rout of San Francisco. It was an astonishing performance but bearly out of the blue the way it would have been in 2011 or 2012, when Uribe hit a combined .199 with a .262 on-base percentage and .289 slugging percentage. Despite being on the roster all season last year, Uribe had one plate appearance after August 27. But practically from day one in 2013, Uribe has brought plate discipline to his game, already surpassing his 2011 and 2012 totals in walks, and when he has swung, he has made an impact – to the point where Dodger fans have slowly learned not only not to fear his at-bats, but to embrace them. Last summer, Dodger fans were begging for his release; his 2013 OPS is now exactly .800. Combine that with the fielding that was always solid – in his latest exploit, he turned a bullet by Matt Cain tonight into an inning-ending 5-4-3 double play – and the Dodgers have had, believe it or not, a productive third baseman. Tonight, with the Dodgers trailing 1-0 in the second inning, Uribe worked the count to 2-1 in his favor, then delivered a two-run double to left field. Then, with the bases loaded and one out in the third, Uribe worked the count full before sending a hard, sinking liner into left field that Carlos Gonzalez of Colorado might have caught, but he was yesterday’s opponent. Cole Gillespie dove for the ball and missed, and Uribe had his first triple since July 28, 2010. Uribe’s two-run homer in the seventh not only helped him match his career high in RBI in a game, it put him a single away from hitting for the cycle. Alas, Uribe went down in the ninth on a check-swing strike three. But back to the original point. What Dodger endured two miserable years, while collecting a big paycheck, before putting it together in his third season? Looking at this list of Dodgers in the post-1975 free-agent era, no one with the profile of Uribe leaps to mind. It’s not like Dave Goltz, Don Stanhouse, Mike Davis or Eric Davis turned it on in Los Angeles after stinking for two years. But Uribe has. This week, in five different games, Dodgers have been within single hits of hitting for the cycle. Yasiel Puig needed a home run one game and a triple the next, Hanley Ramirez needed a triple Wednesday, Adrian Gonzalez needed a triple Thursday, and now Uribe’s missing single. 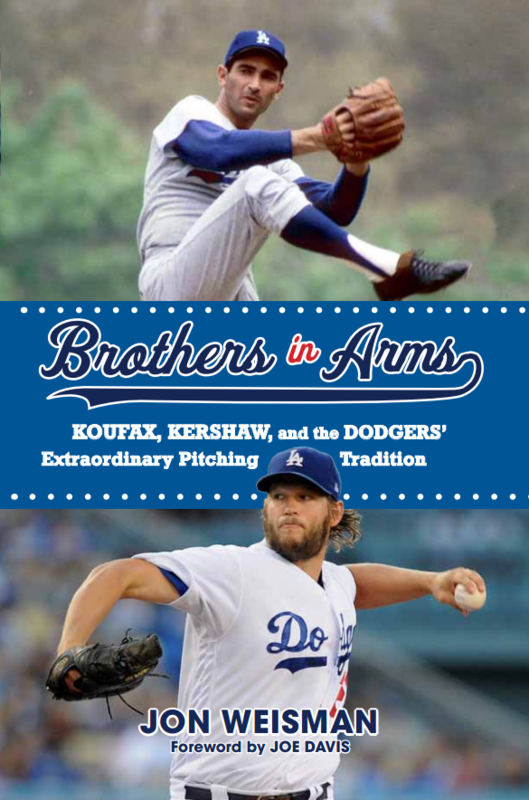 The Uribextravaganza and the final score would indicate a night of complete celebration for the Dodgers, but that’s not the case. Two innings into the first game in which the Dodgers had Carl Crawford, Andre Ethier, Yasiel Puig and Matt Kemp on their active roster, Kemp irritated the AC joint in his left shoulder with a swing. He is day to day. Shame about Kemp – he was coming out of his funk, I believe – but a damn good thing Crawford is back and healthy now. Vin called the player Bubbles Burns; our commenter Bob_Hendley pointed out the player was Oyster Burns (nee Thomas). Burns did the deed on August 1 a day on which Brooklyn played a DH against the Pittsburgh Alleghenys. I’m guessing the cycle was in the second game which Brooklyn won 20-1 rather than the first game which was only 7-3 for the Brooklyn team. Burns did hit for the cycle in the second game, which only lasted 8 innings. I tracked down the Brooklyn Eagle article for the game. The game was called on account of rain and the fact that it had been a long day for everyone. The first game lasted 1:15 and the second game was in the 8th and had already lasted 1:30! The 1692 fans were getting restless and many had gone home early. In the second game, Brooklyn scored 11 times in the 1st inning. Interestingly, the box score of the era doesn’t list the number of doubles, triples, and homers. Just hits. The Pittsburgh team that Brooklyn swept that day finished the season 23-113. Pittsburgh had on its roster at some time in 1890 BOTH Phenomenal Smith AND Crazy Schmit. Pittsburgh lost the first game 4-3 with Guy Hecker, who was actually a very good pitcher (and even better hitter) on the hill. The Alleghenies pitching staff dropped off quickly in talent after that. Hecker played more first base than pitcher that season. Pittsburgh finished last the next season too, but won 55 games. By 1893, they finished the year in 2nd place. Take about the MTV generation! I guess an hour and a half was just about all fans could take with the dead ball. We take our job seriously! Jon, you must have wanted Uribear to get a single so much that you gave him one in your write up in the second inning (but took away his double). I am still an Uribe skeptic, and don’t want to see him back next year. Depending on how he finishes this year and next year’s contract price, he certainly should at least be considered. The Gnats will have an opening at third, as Flabsoval recovers from his multiple off-season liposuctions. Next year is an entirely different issue. I don’t want the Dodgers to do a Brandon League with Uribe either. But that doesn’t change how astounded I am by what he’s doing this year. And the beauty is you can truly see how he’s doing it. I agree he deserves to be in the lineup until he proves otherwise, but I think he’s much more valuable in the No. 8 spot. I am unconvinced that he has any significant value beyond this year. As I recall, Mark McGwire supposedly was going to make Uribe a particular project of his. It would be interesting to know whether he did indeed come up with something new and, if so, both what it was and how he made it sink in. A trivial note. The year after Oyster Burns hit for the cycle, Connie Mack began playing for the Pittsburgh franchise. I mention this because someone once pointed out that at spring training in 1950, Mack was about to manager the A’s for his final season and apparently may have been introduced to a young broadcaster getting a month-long tryout with the Dodgers. If so, that handshake connected a man who was involved in major league baseball from 1886 until 1954 with The Vin, still with us in 2013. Amazing. With Kemp out – hopefully not for long – the lineup becomes more vulnerable to lefties. The fragility of Kemp and Crawford makes it difficult to even consider trading Ethier. Have researched this further, and there’s simply no one in Los Angeles Dodger history who comes close to doing what Uribe is on pace to do – follow two below-average seasons with an above-average season. That is, not counting rookies/prospects just coming up. With Kemp out and a lefty on the mound it isn’t too surprising. the lineup doesn’t look as balanced without Kemp in it at 6. Am I to understand from MLBTR that the Dodgers are doing to send THREE pitchers AND money to the Marlins for Nolasco? Did Ned jump the shark? Harper: 45 hits in 171 at bats. Puig: 50 hits in 119 at bats. So of course Harper is the starting right fielder for the National League all-star’s and even considering Puig is ludicrous.